Like most AHL teams at this time of the year, the Wilkes-Barre/Scranton Penguins' roster looks vastly different than it did to begin the season in October. Call-Ups to the NHL parent club and injuries of their own have contributed to the Baby Pens' constant roster turnover. Through it all they have managed to stay within striking distance of the Hershey Bears, who currently lead the division by mere percentage points. The Bears have one game in hand, and the two teams still have to play each other three more times. Unlike the NHL teams, who are gearing up for the postseason by getting key players healthy and getting everyone on the same page system-wise, AHL squads can still expect to incorporate some new blood. 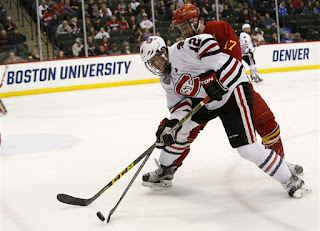 It's not unusual for a young player out of Major Junior, or an NCAA upperclassmen, to sign an ATO (amateur tryout contract) with the AHL affiliate of the organization that selected them in the draft, and occasionally an undrafted player will do the same thing. Of course AHL teams can also receive a big boost from players being re-assigned from the NHL, mostly after the parent club has been eliminated or begins to get healthy bodies coming back to the lineup. There are a few notable players not currently with WBS who can potentially play a major role during the playoff run. Matt Murray is one of the top goaltending prospects in the world after a monster rookie season in the AHL which saw him claim both the Rookie of the Year and Goaltender of the Year awards. He has made quite the impression in his first true stint in the NHL: 8GP, 5-2-0-1, 2.09 GAA, and a 9.26 save percentage. At the time of his call-up, Murray was 2nd in the AHL in goals against and save percentage. Needless to say, this young net-minder could easily steal a playoff series, or Calder Cup for that matter. The problem is that Pittsburgh could decide to do one of two things. Either they keep him as Fleury's backup and let him see what the Stanley Cup Playoffs are all about from the bench, or they could send him back to WBS where he will gain valuable playing time in the Calder Cup Playoffs. The risk with sending him down is that if he were to get injured, and Fleury suffers the same fate, Jeff Zatkoff will be relied on to take the NHL Pens to the promised land. (Not Good.) My prediction: GMJR decides to send him down and let him play, rather than watching in Pittsburgh. Obviously this would be great news for anyone involved in Wilkes-Barre. 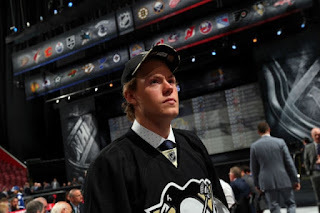 Sprong was just drafted 46th overall in the 2nd Round of the 2015 Draft. He made a major splash in Pittsburgh early this season by making the NHL club out of training camp. The rookie stuck around for a while, playing 18 games, and scoring 2 goals while going -1. He certainly did not look out of place, creating numerous chances when he did crack the lineup. He didn't show up on the score sheet nearly as much as he could have. Eventually the Penguins made the decision to send him back to Juniors. Instantly Sprong caught fire and hasn't cooled off, and has his Charlottetown Islander squad one win away from the second round of the QMJHL Playoffs. In 33 games he posted 16 goals, and 30 assists for a total of 46 points. In Mid-February Penguins Assistant GM Jason Botterill mentioned that Sprong would likely be sent to WBS when his Junior season ends. since then there has been constant chatter in northeast Pa., about just when the young sniper will arrive. 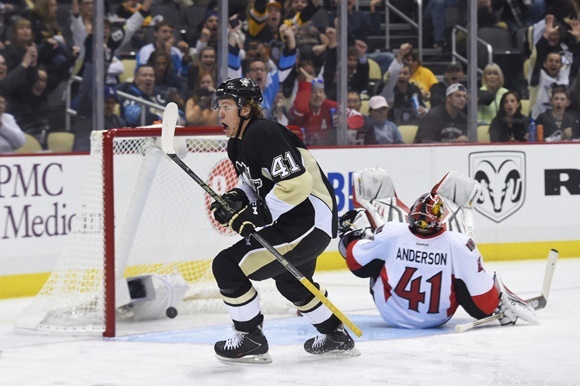 Head Coach Clark Donatelli has to be salivating over the possibility of adding Sprong to the budding chemistry of Dustin Jeffrey and Dominik Simon. My Prediction: He arrives just in time for the Calder Cup Playoffs and does in fact slide onto that top line with Jeffrey and Simon. Earlier this week Pittsburgh signed Prow to a 2 year entry level contract, and assigned him to WBS. Prow is expected to arrive today, but not expected to make his AHL debut until next weekend. He is an offensively gifted defenseman, who played all four years of his college eligibility, and brings much needed firepower to the Wilkes-Barre blue line. Will O'Neill is currently in the Top 3 in AHL Defenseman scoring, but since the departure of Derrick Pouliot to Pittsburgh, the Baby Pens are desperate for another puck mover, and a Power Play Quarterback to man the 2nd unit. It seems as though Prow will have every opportunity to make his mark, and be a mainstay in the lineup throughout the Calder Cup Playoffs. While wearing the "C" the Senior scored 8 goals, and added 30 assists for 38 points in only 37 games. My Prediciton: Prow plays on the third pair with Niclas Andersen, while playing the point on the 2nd power play unit. Any or all of these players joining the roster during the stretch run, will certainly play a factor in just how far this year's AHL Penguins will advance. Thank you for reading!